As I already told you, I have a love hate relationship with food. I love it so much, especially my sweets, but I hate the results; gaining weight and not feeling fit. I have found a perfect way to reset myself, a kind of detox treatment. This way I kick off my sugar addiction and appreciate good and healthy food again. This fasting treatment is called Fittergy Sportvasten (Sport Fasting). Like the name stated, it is no diet or detoxing; sporting is key in this transformation. This training method will help you to lose weight fast, feel more energized and lose centimeters of your belly size in only 10 days. Under supervision of a personal coach, who guides you through the 10 days program; you will train your body to switch from a sugar to fat burning modus. Of course it is the main goal to maintain this switch and change your lifestyle in order losing more weight or maintain the result. 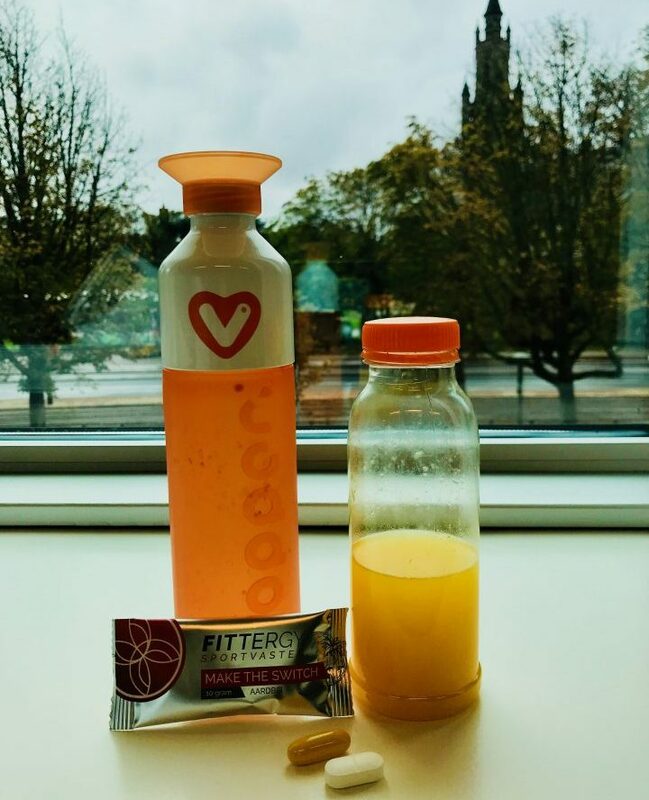 This program really works for me; it gives me a boost to change my lifestyle, but the challenge is to maintain it; not grapping the sweets again!! Below I will explain how the Fittergy Sport Fasting program worked for me. For clarification I’m not a coach and if you like more information, please check the website of Fittergy. 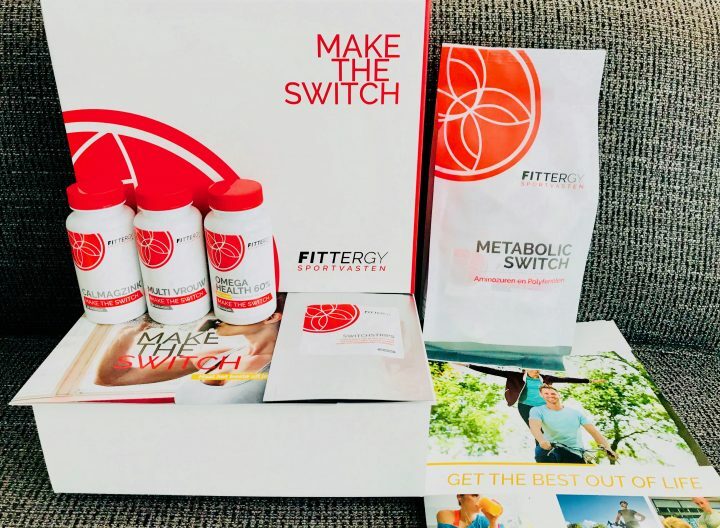 How does Fittergy Sportvasten work? 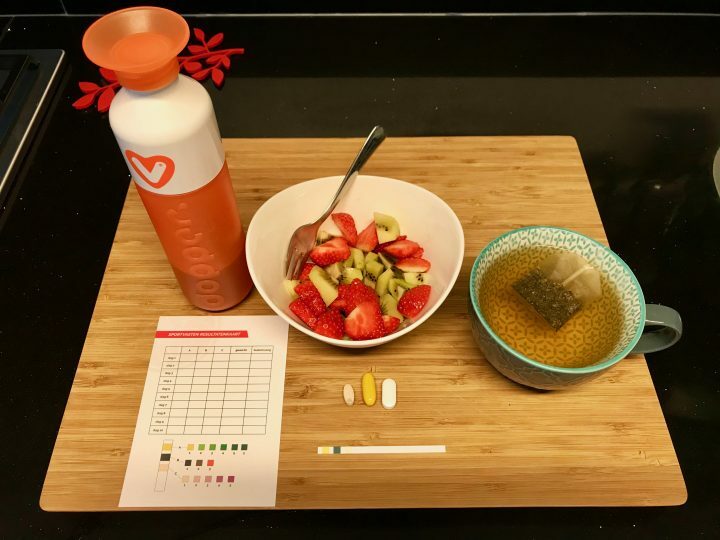 First you have to find yourself a coach that will provide you with a box full of vitamins and supplements especially made for this 10 days program. He or she will explain the process and will guide and track you during your fasting period. You need a lot of dedication, it is definitely not easy so determination is key. Tip: I will recommend you the coach Liesbeth Booij. She is very dedicated and keeps track of your progress. Even after the 10 days, she keeps in touch on how you are doing and provides tips to maintain the switch. Click here for her website (in Dutch only). The training program consists of three phases: decreasing eating food days, fasting days, increasing eating food days. During these days you have a special protocol with food you have to eat or/and drink, together with the right supplements. The main point of this program is the sporting part. You have to practice an endurance training like; running, rowing or cross-trainer at a specific heartbeat level according to your fitness level for about 20-30 minutes per day. For me it was between 120-150 beats per minute. After a couple of days you can check via the provided urine strips, if you switched your body from sugar to fat burning. In this period you get rid of your carbohydrates (rice, bread and pasta) and animal proteins (chicken, fish and eggs) in your daily meals and reduce the portions of your vegetables; even to an all-day liquid day on day 3. Together with every meal you take the vitamins and supplements provided in the toolkit. Tip: Weight yourself at one consisted time during this program, this way you can compare your results the best. For me it was every morning, right after waking up. The sporting went very well; I have the feeling to do more than the 30 minutes, but it’s important to stick to that, it will be harder in the coming days. But it is very motivating even in this period I already lost almost 2 kilos!! Now the real stage starts! Every “meal” is about 100 ml of fruit juice. 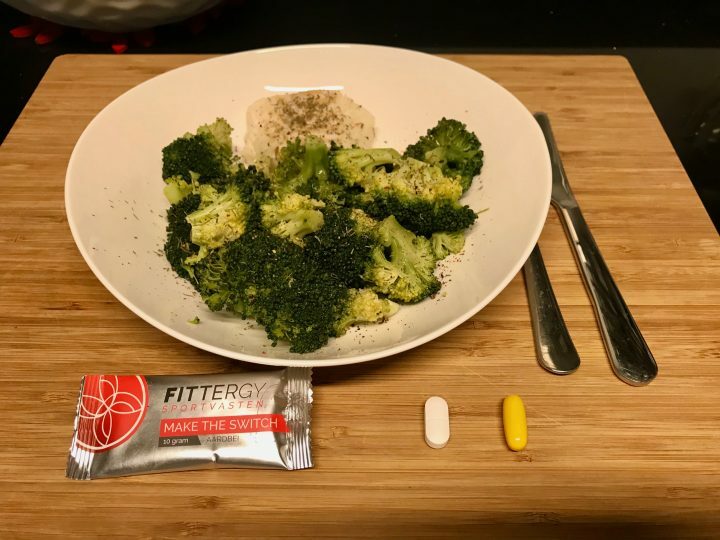 If you read this you probably wonder: “How is it possible not eating for three days and sporting at the same time?” I had the same thoughts, but for some reason the supplements help you so much going through the day without being hungry!! This really keeps amazing me. This was not the first time I did this Sport fasting program and I am more experienced so I did an additional day of fasting (4 instead of 3). I went so well without any weakness and by doing this I created more depth in the process. On the second day I made the switch. You can see that by using the urine stripes 3 hours after your sporting activity. Tip: Because the fresh juices could be very sweet, I mixed them with water. This way you get more water in and it tasted even better for me (less sweet). The first day they colored pink/purple between block 2 and 3; the last day I was between 3 and 4. The last day of fasting I could feel a bit more tired after sporting than before, but in general felt super fit, sharp and active; realizing now what sugar is doing to me…… Result after fasting period; minus 4.4 kilos and 2 centimeter of my waist! Tip: Get yourself a “professional weighing scale” which provides you the kilos, % of fat, % of body fluid, fat free mass, bones, age and BMI. This helps to keep track of your body composition. Eating again!!! Of course start with little portions of fruit and vegetables in the first days, then adding light proteins to the meals. Still sporting every day and taking the supplements. I became a little bit nauseous after I ate my first fruits after my fasting period; but not for long. My body needed to adjust to the normal food again. In this period you will probably stay stable or loss less weight than in the previous phases; your body is still burning fat but you are taking in more food too. 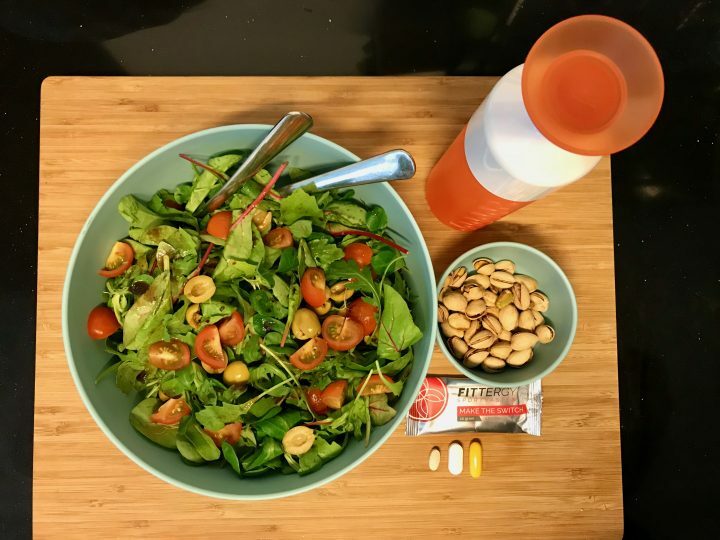 Still feeling great and the protocol subscribes a lot of food; my stomach had shrunken a lot, almost difficult to eat it all…… A big highlight in the day is eating the 50-100 grams of unpeeled and unsalted pistachios after lunch and/or dinner. Pistachios in small portions help to lose weight; they are real fat burners and helps your metabolism. Indeed I lost almost 5 kilo’s and 3 cm of my waist and on top of that I feel more energized and fitter! For me this is a quick start to kicking the sugars. Normally I graved for cake and chocolate but now don’t have the urge anymore. Tip: To keep track of my results I added all my data in a spreadsheet. This helps motivating me to see the kilos drop even after the 10 days. Fittergy has a website where you can add and monitor your results as well. I want to keep it that way; the main goal is to maintain and follow this method (Keep the Switch) and keep my body in a fat burning modus!!! During phase 3; I noticed that my condition got better, my heart rate remained low compared to phase 1 and 2 during my sporting practice. That is why top athletes do this program as well, this to increase their sport performances and endurance. Sport Fasting is a personal guidance process and will costs around 250 EUR depending on the amount of support and personal guidance. This is including the supplements, vitamins, urine strips and personal coaching. Don’t forget that the cost of food will be reduced (no more sweets, chips, beer and wine) for at least the 10 days; which saves you some money too. But above all; losing weight, getting thinner, get a better condition and feeling more confident, energized and fitter is priceless!!! See my food blogs with Food Inspirations that will help to maintain the switch and eat low carb healthy meals. Got a lot of new food inspirations after these 10 days! Good luck and let me know your experiences!! Environ Skin Care: Go or no Go?! Activated Charcoal Toothpaste: Go or no Go?! How I handle my Grey Hairs! Welcome to my website Let Me Inspire You!! Keep checking my website: Next travel coming up to Central America! In January I will start traveling for 9 weeks to Middle America. Will start in Mexico City and head down South of Mexico, Guatemala, Belize, maybe Honduras and will end up surfing in El Salvador.